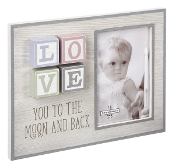 Be My Baby Stretched Canvas Wall Decor. Collection celebrates baby's arrival with soft pastel designs and heartwarming and humorous sentiment messaging Collection celebrates baby's arrival with soft pastel designs and heartwarming and humorous sentiment messaging. Be My Baby MDF Wall Sign with Giraffe Design. Collection celebrates baby's arrival with soft pastel designs, and heartwarming and humorous sentiment messaging. Be My Baby MDF and Glass Photo Frame. Collection celebrates baby's arrival with soft pastel designs, and heartwarming and humorous sentiment messaging. Shhh Baby Sleeping Soft Door Hanger Available in 4 Colors Chalk Sign "Weeks Until Baby"
Chalk Sign "Weeks Until Baby" This box sign makes a gorgeous addition to any grandmother's kitchen. Makes for a great gift for a loved one in your family. Weeks Until Baby Black and White color and letter design 9"x 9"
Commemorate your baby shower with an autograph banner! Track your newborn's progress with the weeks since birth, and achievements attained.